The 2017 British Schools Score Orienteering Championships were held at Rother Valley Country Park near Rotherham in South Yorkshire on Saturday 14th October. Approaching 300 juniors hundreds competed, from schools from far and wide in Great Britain. The terrain in the country park consisted of three very large lakes, the River Rother and a mixture of open areas, woodland and thickets. There was a good path and road network. 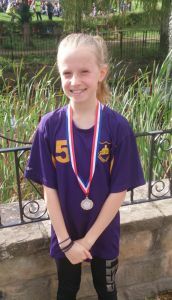 Maja Robertson of ESOC came 2nd in the Year 6 Girls class, representing Longniddry Primary School – congratulations Maja! More information about the event, including the results and photos, is available on the page of the British Schools Orienteering Association website.